I have bought multiple properties. Most were apartment buildings, where tenants paid rent, to cover all operational expenses, and provided my family with housing, and tax-sheltering, and profit. I do not see what point you are trying to make. So combined with your w2 wages your total income was? During the 2008 Recession, I did. that was my gripe with our friend eddie in the other thread about who is joining him retiring in their 20 and 30's . then he went on to say he is living life nicely on 20k a year . but he failed to mention somehow he got a paid off house ,a car , an inflation adjusted 20k income plus free medical insurance . a disingenuous thread , at the least . 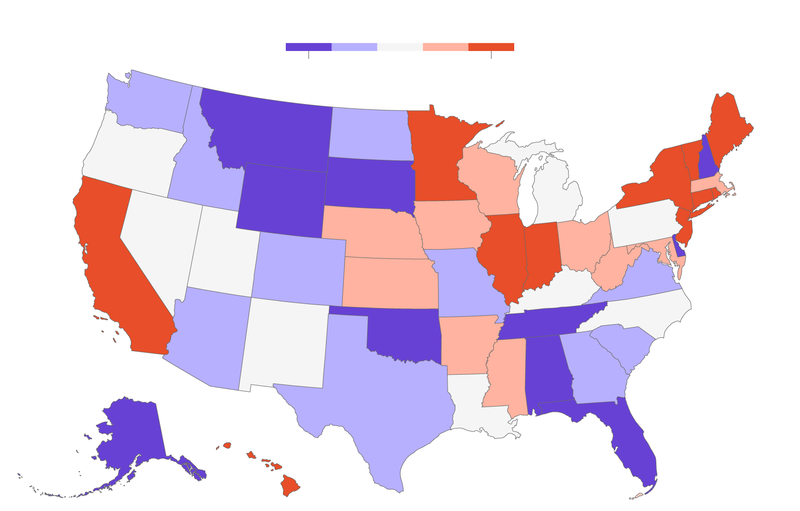 Tax burden by state. Purple is good, red/orange is bad. When I was on Active Duty I had a Navy paycheck and I had rental income. I also had mortgages and a lot of other expenses to maintain those apartments. We kept our AGI close to zero, always less than $1,000. We lived on my paycheck and we spent the surplus on the apartments. Rental income went to the expenses of those properties and to buying down the mortgages, to build equity and avoid income taxes. After I retired we used the equity that we had built-up to buy our retirement homestead with cash. Then later during the Recession, we went through bankruptcy after we lost all tenants for a year. We never used rental income for our own living expenses. They were vehicles to build equity and shelter my salary from Income Taxation. I view it as having been a success. And you are ignoring business expenses. Income from our apartments has always gone into buying down the mortgages. If we had ever touched any of that money for ourselves we would have had to pay income taxes on that money. It has been a number of years since that last time we had any apartments. We lost the last apartment complex when the Recession forced us to go through bankruptcy. I do have a history of collecting apartment complexes. And I will do it all again. At the time of my retirement, we were down to only one property. We took the equity out of that apartment complex after I retired in 2001 and we used it to buy our homestead. We own our homestead 'free and clear'. As a side-line I sell farm produce, my gross income from farm sells is less than $1,000/year selling maple, honey, eggs and herbs. After expenses our Schedule F [farm income] is zero. We had a bankruptcy in 08/09 and we have not had any rental properties from then until now. I do not have 2mm. I do not have 1mm. We are in probate at this time dealing with the estate of my in-laws. It is going directly into a separate LLC that we are managing and is targeted at purchasing another apartment complex, and it's refurbishment. We hope that this LLC will begin to have rental income in the Fall of 2017. Cash flow from this new set of apartments, held by this LLC, are designated for other purposes, in accordance with the will. We will not be taking any proceeds from that estate. We are fine on my pension income as we have been this past 15 years. We are doing much better since our children have left home. Otherwise we are fine on my pension income. We produce nearly all of our own food. It took us 4 years to gather all the components for a solar power system to power our house, and that got rid of our electric bill. Now that we have been on solar power for a year and a half, we have shifted to a plug-in car. We are charging it from our home solar system. This further reduces our vehicle fuel costs. This summer we will be working on a solar thermal system to heat our home. Our home should then become self-heating, ie without any heating costs. This should further reduce our living expenses. You are still young, its too early for you to determine what is ideal living income for you. I remember at 21, fresh out of college, I was over the moon for getting 35K job. Yes I had low expectation because my parents combine income was 30K maybe. I knew it wasn't much but I could live in that income. I was not even aware of 401K or medical insurance or vacation LOL. Looks like they have the colors reversed. $36k a year in retirement is probably enough to cover the basics assuming you own your home and don't have to worry about rents going up and have no other debts. If you want to travel, drive a nice car, give your grandchildren a nice Christmas, and update your home.. its probably not going to be enough. I'm 32 and have worked very hard for all I have, my wife will have a state pension, I hope to own a few rental properties and we should have an IRA worth about $4,000,000. Couple this with Social Security and we should be looking at $220,000ish a year in retirement after taxes, but honestly I worry that's not going to be enough with inflation in 40 years... So clearly to each their own. OP, it depends on where you live and what lifestyle you want, but it is definitely possible. My husband and I (so 2 people) and our 2 cats, but no kids, spend approximately $23k a year now. That includes a mortgage of around $750/month, not including taxes/insurance, so when that is paid off, we will be at around $14k a year. That doesn't include health insurance costs (hubby's work has great insurance), but there is a big difference between $14k and $36k, that would cover a lot of health care costs. You have to live in an inexpensive area, drive the same car for many years and be a frugal person to do that, and most people cannot do that. But yes, it is absolutely possible. I still wouldn't want to HAVE to do it with only that money, and no reserves at all. And having kids makes a big dent in the equation. Plan for that pension to SUPPLEMENT your other retirement savings, not to replace them entirely. In 2016 my w-2 pension income was $17,760 and I had about $1,000 farm income. I have not had any rental income since 2008. I can repeat this as many times as you need. This has still been my income. I have full explained my income to you many times. I can not imagine what other method of explanation you think you need.